On September 18th, Min Wanli, Chief Scientist of Artificial Intelligence at Alibaba Cloud, had a special sharing session on "the road to digital intelligence" at Alibaba Cloud MVP Summit 2018. 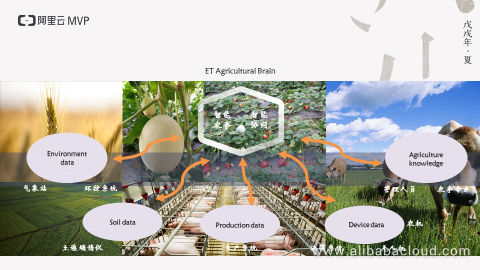 In his presentation, Dr. Min introduced the Alibaba Cloud ET Brain suite of solution, including ET City Brain, ET Industry Brain, and ET Agriculture Brain. This article is a summary of Dr. Min's speech, with a lot of valuable technical information. Where does the intelligence come from? Human intelligence comes from the brain, and the industry's intelligence comes from the ET Brain. The ET Brain simply exploits the value of new data energy. Data energy is fundamentally different from traditional energy. Traditional energy, such as oil, is not renewable. The oil in the Middle East is running out. Data energy is inflatable. If the value of data cannot be rapidly exploited, it will depreciate. What we are doing is to instantaneously exploit the value during the period of data inflation. Hundreds of years ago, precursors were already thinking about how to handle massive data. We found that during more than two hundred years from 1713 to 1973, data was analyzed outside-in. People constantly searched for patterns in the massive amount of data, and constantly improved the ability to resolve the essence behind the phenomena with formulas. With the deepening of data analysis and application, data computing load has also increased. 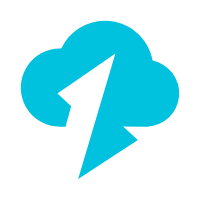 Leveraging cloud computing capabilities, the value of data has finally been rapidly exploited through real-time computing. Where can the data and vertical scenarios be combined to unleash huge industrial value? The answer is data intensive industries. Let's look at a city as an example because a city is a typical data intensive scenario. Sensors in every city are constantly generating data. Where there is data, there is a chance for data technology, and pain points to solve. The ET Brain has realized the integration of sensing and action. It’s a pity if there is only sensing but not action. When there are insufficient computing resources, although a large number of sensors are deployed, the information they perceive cannot be computed or analyzed, and decision cannot not be made. 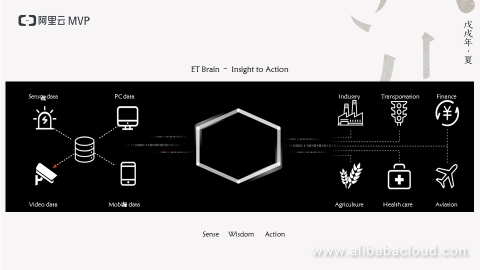 With data computing capability, the data can be presented as AI (Actionable Insight), and perceived information can be analyzed based on the ET Brain to make decisions and actions. 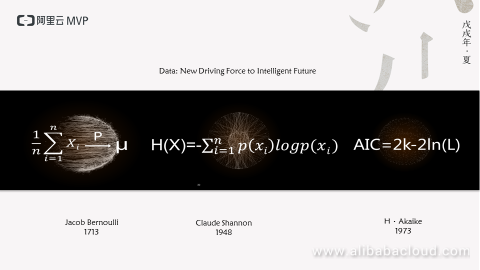 How can intelligence be realized? A wider horizon makes intelligence. The intelligence on any single end is only local intelligence, and the ET Brain realizes a global intelligence for all networks and all ends. The ET Brain's core is big data rather than hardware. We provide the capabilities of intelligence and computing. The more data, the more intelligence, and the more value. Building a smart city starts with city genetic analysis. Why do we have to do something so basic? Just like in the medical field, gene sequencing can be an important means for the diagnosis and treatment of many genetic diseases. Similarly, for a city, the deconstruction of the digital foundation using data is an important and fundamental issue. 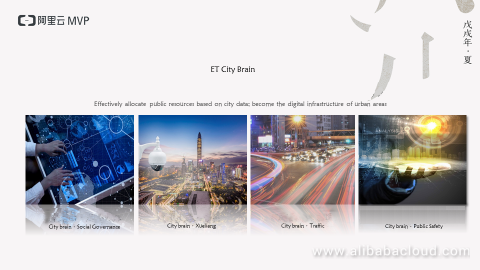 Alibaba Cloud and China Academy of Urban Planning & Design have jointly launched the urban gene pool to build digital twin cities, digitally interpret the city structures on the cloud platform, and realize a closed loop of urban planning and urban governance. For example, in one of the busiest urban roads, real-time linkage of traffic lights is very complicated. As you all know, we halved the transit time for ambulances in Hangzhou a year ago. Before an ambulance arrives at the intersection, the signal light turns green in advance, as if someone cleared the road ahead, enabling unimpeded passage. The ambulance route is planned as soon as 120 answers the emergency. Then the arrival time to each intersection is predicted with second-level precision, and the time is synchronized to the traffic light system, which will predict the number of the vehicles waiting in front of the traffic light, and clear the vehicles in advance. When the ambulance arrives, the traffic light will turn green. The whole process requires a high degree of synergy in order to perform actions within seconds, which is challenging. 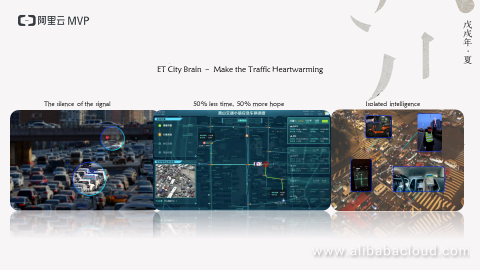 Presently, ET Brain has already been implemented in many cities such as Hangzhou, Suzhou and Kuala Lumpur, positively impacting these cities. When I told the German Aerospace Center about the Kuala Lumpur ET Brain Project, they felt that such a project was due to the environment for innovation in China. At the same time, we have enough data and data density. Population density is equal to data density, which is further equal to value density. Today, we have made the ET Brain open-source. 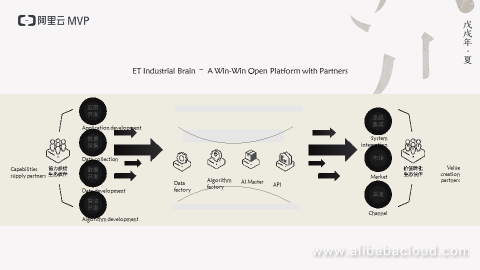 Any engineer or company with technical development capabilities can become a developer of the ET Brain open platform. 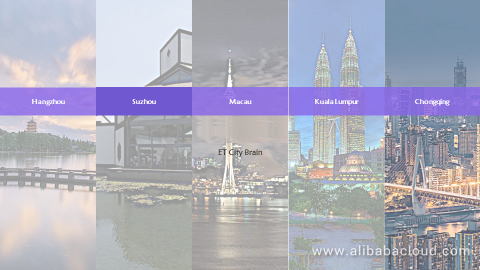 We provide urban databases, a city platform, and computing capabilities, as well as an AI modeling platform. We can work together to make more and better applications like the ambulance project. The application we are currently developing is just the tip of the iceberg, proving the possibility that the combination of a big data platform, cloud computing algorithms, and data may produce immeasurable effects. 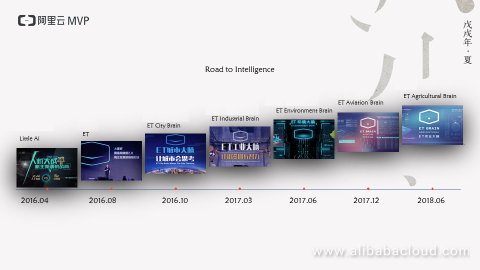 I think this may be the most important message I want to convey: the ET Brain is not just exclusive to Alibaba Cloud, and we hope that more developers can work together to implement more innovative applications. 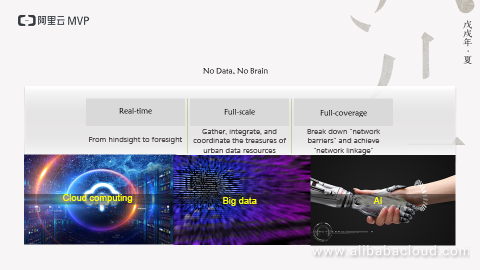 It also applies to industry, and Alibaba Cloud has opportunities in all data intensive areas. So we have linked all the data on the production line to a brain in real time, for central management and real-time feedback. Why? Maybe you have heard a story: when faults occurred in production lines imported during the Chinese Economic Reform, German engineers had to be consulted because only they understood the fundamentals. German engineers only sold us production lines, with at most production manuals. We never knew how to coordinate workers in a production line, or how to remedy for a worker to ensure the smooth operation of the production line when a worker earlier in the chain made mistake. It seemed that we were given a powerful sword, but we couldn't yield it and had to ask others for help. Today, the ET Industrial Brain integrates all the historical production data together. After full analysis, there will be quantitative relationships between various parameters. Such quantitative relationships were not identified by those experienced workers, because their first-hand experiences during their careers were limited. The ET Industrial Brain works like Alpha Go, which can learn all machine parameters overnight. It is constantly learning new things every day. As the yellow two-way arrow shown in the presentation above indicates, it is continuously evolving, because the more data, the smarter it is. These are all real cases implemented in the industry. 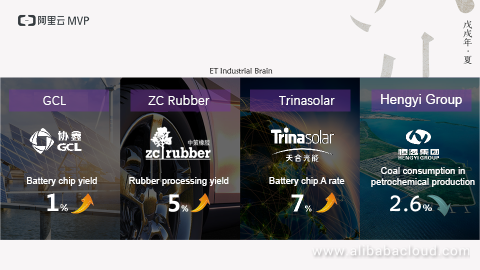 For example, GCL's battery chip yield has increased by 1%, converted to a net income of more than 100 million CNY a year; TSL's product yield has increased by 7%, which also equals to profit of more than 100 million CNY. We did this in only a few months with no experience. If you have expertise and established platforms in the industry, you may do better than us. So, today we use these percentages, first, to prove that the data intelligent path is feasible; second, to prove that our platform has great potential, enabling people who lack expertise in the field to succeed, and those with expertise to flourish. Similarly, the ET Industrial Brain is also open. On August 1st, we held a press conference. 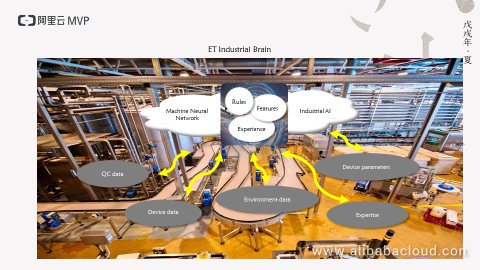 The ET Industrial Brain was made fully open, from data access to algorithm access, to application access, and was integrated with ecological partners. 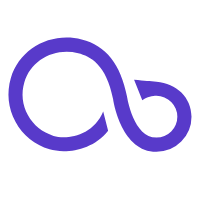 Partners can also use their own algorithms, or they can package their own applications. They can even use their own data if they are familiar with industrial sensors. Alibaba Cloud has completed the first steps, and the second step is to pass the baton. It's just like a 4×100 meters relay. 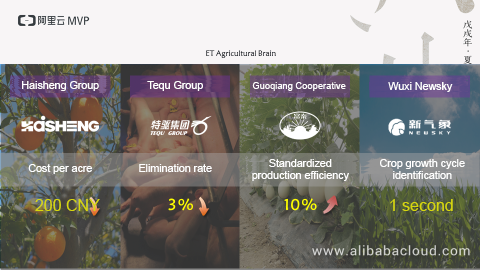 Let me now talk about the ET Agricultural Brain. With the cloud platform, big data platform, AI algorithms, and the client's data, we can customize the fertilization and irrigation for each acre. Similar to customized solutions for buyers, customized solutions for acres divide a farm into multiple blocks, each having different irrigation. The rainwater is uneven, and the moisture, pH and fertility also vary between soils. Today the customized solutions for acres enable precision agriculture, and real-time feedback. 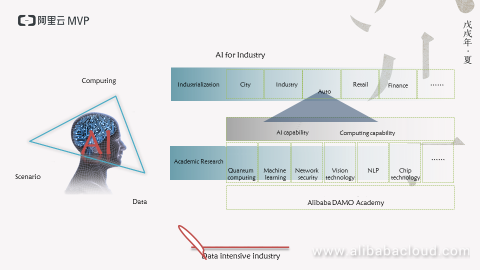 Presently, the industrial AI has been successfully implemented in the primary, secondary and tertiary industries. 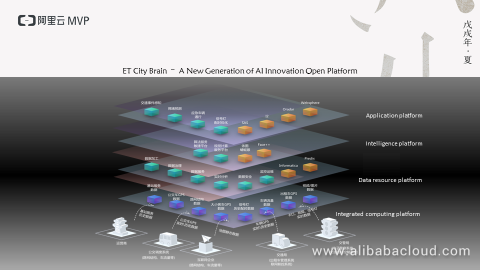 The ET Brain has been selected as a new generation of national AI open innovation platform, and any developer can customize applications based on this platform, benefiting a wider range of users. 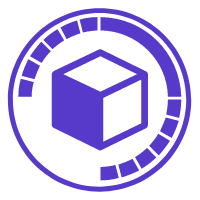 To fully open the ecosystem, what we have to provide to the partners is not only product white papers, but also on-site guidance. 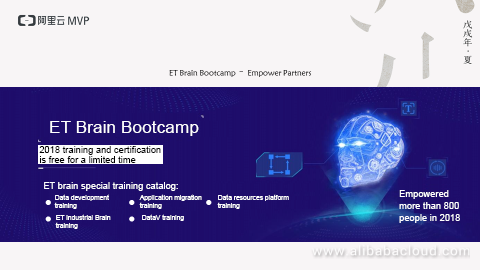 Alibaba Cloud has organized the ET Brain training camp and invited registered developers to Hangzhou, providing full training from the initial data access and data processing ETL, to algorithm and application development on the platform, which ensures that the trainees can practice using real development. More than 800 trainees have been trained and certificated. Lastly, I want to say that the source of the cloud is not important, but the intelligence it brings is the most important. 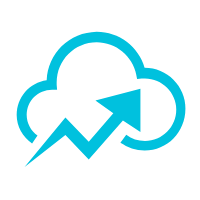 Migration to the cloud is not the purpose or the end. The purpose is implementation, which produces intelligence. This intelligence requires combined effort from all of you.